High Quality Bone Safety Roll-Up Traffic and Construction Signs are available in standard and premium mesh, non reflective vinyl, and reflective vinyl. Reflective Vinyl Signs are available in 3M High Intensity and Diamond Grade reflective material, as well as Orafol Marathon and Superbright sheeting. 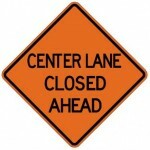 Bone Safety Traffic and Construction Roll-Up Signs are available in 36" x 36" and 48" x 48", as well as custom sizes. Bone Safety has a wide selection of MUTCD legend Roll-Up signs available. The patented Bone Corner Pocket has become the industry standard for roll-up signs. The durable Lexan corner pocket holds the sign frame firmly into place while protecting all four corners of the sign for increased durability. 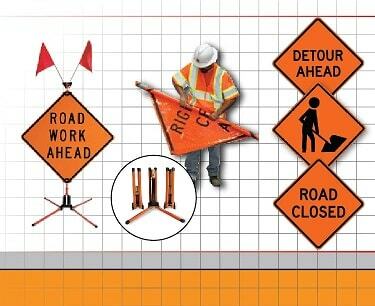 Available in Sizes 36" x 36" or 48" x 48"
Bone Safety Signs is one of the leading manufacturers of temporary traffic control devices in both the United States and Canada. Bone has been an integral part of the growth of these products in our industry and the safety they provide to our customers. Our company has a full line of both roll up and rigid sign stands; all Bone Stands and Signs are NCHRP-350 approved. Bone Safety also offers complete digital and silk screen printing services. Regardless of your specialized legend or logo requirements, Bone is equipped to build a roll up or rigid sign to meet your needs. Bone Safety Signs successes have been built around “listening to what our customers have to say” and building our products around their concerns and requirements.